* * SPOILER ALERT * * – Ye be warned if you haven’t yet seen Hitchcock’s Psycho. YouTube embedding is being finicky...please click photo to access clip! I was watching Mad Men last night and marveling over how much I continue to sympathize with the character of Don Draper. Am I mad? The guy has cheated on his wife for the first three seasons, even after she bears his third child, and still those dramatic shots of Don sitting in isolation as the camera gradually zooms out still pluck out a melancholy little banjo tune on a heartstring or two. This brings to mind a post I recently read on Milo James Fowler’s In Media Res blog that discusses how the villains in books, TV, or film tend to fascinate us, to the point where we might find ourselves cheering for them. When I read this, I immediately thought of Alfred Hitchcock’s Psycho, and how the director’s genius for creating suspense through cinematography and Anthony Perkins’s stutteringly shy Norman Bates always leaves me biting my fingernails each time Norman is close to getting caught. The part directly following the infamous shower scene, for example, shows Norman pushing a car (with Marion’s dead body inside) into a swamp. As slowly as if the water was molasses, the car glub-glubs down until, suddenly, it just stops. Norman swallows in anxiety, and after several looong seconds, the car continues to gurgle down into the swamp’s depths, now fully concealed. There is something about the shot-reaction-shot sequence here that makes the viewer (I know it can’t just be me) tense on Norman’s behalf and want the car to keep sinking just as much as he does. Why is that?! Not that Don Draper exudes the villainy of a murderer with a curling black mustache and a damsel in distress bound in rope underfoot…but that’s precisely my point. For me, if a villain is in the least bit complicated with a sense of vulnerability, I will sympathize. The Don Draper character mesmerizes me because I can’t quite slide him into a specific slot; he is complicated by a darker past and an inner struggle between being a good person that does right by others and a psychopath that acts in complete disregard of them. Norman Bates is a mentally unstable young man whose psychosis is likewise triggered by a difficult childhood; in his conversations with Marion before her death, we see the friendly, likable side of him that is tormented by the wicked personality of his mother that he’s invented in his mind. It’s the classic struggle of the good versus evil within each of us, after all, and a great many fascinating stories have been written around this internal conflict, the most engaging of which (for me) tending to be when the protagonists and antagonists of the plot at times blur into each other. 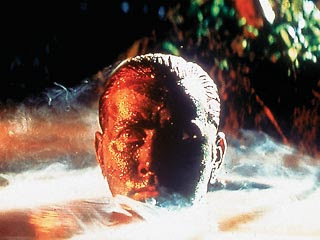 (As you can see in the photos above, Francis Ford Coppola’s Apocalypse Now is one of many films utilizing the imagery of duality—here, both Martin Sheen and Marlon Brando’s faces are half in light and half in shadow—as who is the “hero” and who is the “villain” is called into question.) As it stands, Don is a flawed protagonist just as much as Norman is a well-intentioned antagonist. This entry was posted on Wednesday, April 14th, 2010 at 20:02	and tagged with antagonist, Apocalypse Now, Don Draper, HItchcock, in media res, internal conflict, Mad Men, Norman Bates, protagonist, Psycho, sympathetic character, villain and posted in Character, Conflict, Essay, Musings on Writing. You can follow any responses to this entry through the RSS 2.0 feed. « Only in My Dreams! Hmmm, what to do now? I definitely don’t want to compare my creative outputs with iconic stuff like you mentioned. Still I wanted to share an experience I had with my first novel. I had the very first idea for it with 17, and knowing nothing about writing, just started writing about a character I liked. He was nice and innocent and smart and likeable, but he had this brother who was irritable and edgy and hard to like and had loads of dark secrets. By the time I had finished the novel, my main character had been sidelined by this dark guy (as dark guys do, obviously). As stupid as it sounds, but I found myself following him round, wanting to know why he was the way he was and what it all meant. Long story short – he was just so friggin’ more interesting! It’s always compliment enough that you take the time to read and comment on my stuff. And the inspiration goes both ways! Ah ha! See? It’s true, isn’t it. I love that you’re redeveloping something you envisioned years ago–your story is like a fine wine about to be aged to perfection 🙂 I think it’s cool that you’re centering it on the guy “worth hating but mainly worth rooting for” (I can already hear the throaty voice-over saying that as the tag-line to the preview of the movie your book will get adapted into one day…hey, why not?). I’m intrigued already by this twisted dude. There’s so much allure in that dark side (at least when it’s safely trapped inside a novel!). Hahaha – your comment with the voice-over cracked me up! I just can’t deny my advertising roots, after all. 🙂 Oh yes, and bad guys – aren’t they irresistible, when watched from a safe distance? “I am a man: and nothing that is human is alien to me.” I think Terence’s famous dictum pretty much sum it up. Although we may not have done the evil, we have thought the evil, felt it, fantasized about it. And so we sympathize with that in the villain that is within ourselves. I can always count on you for the most poignant of quotations. Brilliant. There are many times we likely think about what we could do, regardless if it’s something that we would do; even then, we might have to question our motivation for not doing evil, whether it’s an intrinsically held value or something externally reinforced. There is something satisfying, then, in seeing the villain carry out our fantasies, isn’t there? I think–to a certain extent–we definitely envy their freedom from cultural mores. And here’s another case in point, in addition to Don Draper: Darkly Dreaming Dexter. Ooh, that’s a perfect example! Good call. And you’re more than welcome for the pingback–you write a great blog that worth referencing! Thanks for letting me piggyback off your idea; your post had given me good food for thought. Exactly! I loved showing film clips for lessons, so the blog has been an ideal outlet to continue carrying that out. And this post in particular is probably a case in point of how much I miss teaching stuff like this…I remember how polished to perfection your lessons always were, and your delivery alone was attention-getting enough. Your kids must love you year after year.